be told is that they can be trained, they just often choose not to be. together to get her cool moves down pat and on video. While Dollwet has spent the bulk of his career helping dogs and people get to understand one another and work well together, it is his cat videos, starring his own Didga, (short for Didgeridoo) that have really been bringing in the bucks. The gray tabby feline is just an alley cat rescued from a shelter in Tweed, NSW, Australia, when she was a kitten. She is amazingly athletic, even in cat circles, and open to being trained. 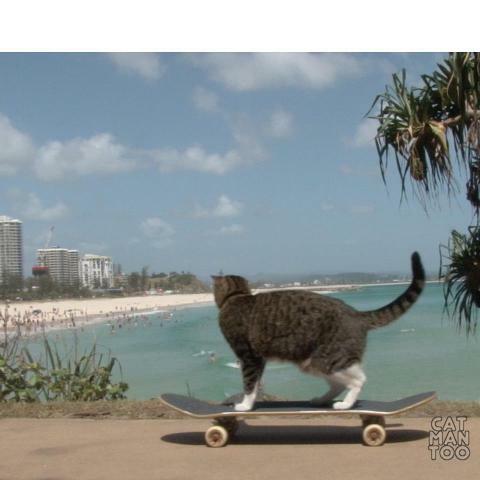 Didga's athleticism has taken her through showing off her skills at Purrkour, the kitty version of Parkour, skateboarding, and even a little surfing. She has even joined in Dollwet's viral Happy Dog video with a bunch of rowdy dogs with a unique level of composure. Dollwet has been an animal behaviorist for 33 years and worked in Hollywood for many years training animals for film and television, and as a dog trainer to the stars. Now he lives along the Gold Coast of Australia and employing his training skills there with his company, Malibu Dog Training. Previous pets of his have also made their mark on the world. Schultz, a miniature Schnauzer, and Quiz, a ginger cat, appeared on television and in movies. 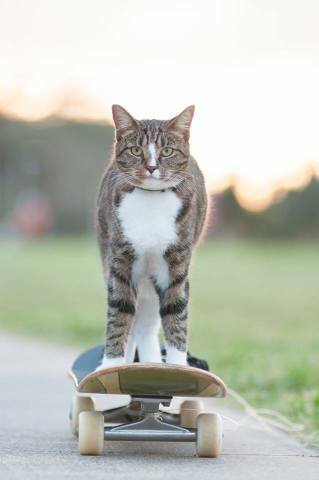 The third part of their act for the skateboarding video is Ollie, the skateboard. When he starts moving then Didga joins him for the ride -- and what a ride that is! Ollie is just a regular skateboard with no remote controls for his part of the videos. The point of Dollwer's videos is to teach people that cats can be trained. He has made several videos to help people learn to train their cats themselves. To check out his videos, click here.